Following up on last week’s post about the different types of SQL injection, this week I want to show how injection can be used to obtain a SQL login and its password. My goal with today’s post is to show how easy it is for someone to do this to your server. My hope is that if your security practices aren’t currently the best, the least you can do is learn and follow the few simple steps at the end of this post to help protect your server. The key to this script is line 13 where we use SUBSTRING() to grab the first letter of SYSTEM_USER and check to see if it equals the current letter we are iterating over (if we could perform a union-based attack and return SYSTEM_USER outright, that of course would be easier). Now if the query takes 5 second to return results, we know we found the correct first letter (“S” in this example). We can repeat this for each subsequent character until we have the whole login. Easy. Note: A similar process can be performed for SQL Users as well. Passwords are more work to obtain. You could start guessing common passwords (eg. “admin”, “ilovesql”, “”, etc…) and trying to use them to login, but once you deplete the easy-to-guess list, you will have to try something else. That first column is SQL Server’s hashed version of the login’s password. And while we were able to determine the SQL login character by character, we won’t be able to do the same for this hashed password. To “crack the hash”, what we have to do is guess a password, hash it, and see if it is equal to the hash we found above. If it doesn’t match, we guess another password, hash, check, and repeat until we find the correct password. Yes and no. 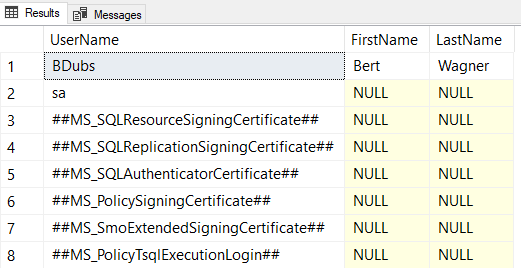 T-SQL is not the right tool for the job here. A better tool would be something that is optimized for hash checking, something like hashcat. Hashcat performs the same type of looping logic to check an entire address space for a matching hash, but it does so very quickly with lots of optimizations (word lists, prefix/suffix mutations, etc..). It also multithreads the process and can make use of graphics cards to perform computations even faster. I don’t want to turn this into a “step by step how to use hashcat to crack your SQL logins” post, but be aware that doing so is fairly straightforward. Also know that GPU optimized cloud machines are easily available, and running hashcat on them easily gets you into the 470 million hashes/second range. Now that may seem like a long time, but remember, that’s one machine doing the processing over the entire character space. The cloud is easily abused for solving performance problems by spinning up additional hardware. The same tools you have to run your company’s cloud workloads are available to criminals as well. And hardware is always improving. Could new hardware come out in the next couple years that will speed this up even more? Almost certainly. Finally this is the longest possible time if would take – if your password isn’t completely random (uses dictionary words) or the hacker knows something about your password schema (all passwords use only letters and numbers), then it’s pretty much game over. Hopefully you are using at least 8 character, random passwords with a full subset of upper and lowercase letters, numbers, and symbols. That should be the minimum you should be doing today, knowing full well that this is already probably inadequate, if not today then in the very near future. If you aren’t using long passwords, then stop reading right now and go figure out how to change this right away. SQL Server allows you to use passwords up to 128 characters long – make use of all of those characters! In addition to using long, random passwords, follow the best practices mentioned in last week’s post as well: use the principle of least privilege to restrict as much access to your logins as possible, and prevent SQL injection from allowing important information from leaving your server in the first place. I’m not advocating that you start using SQL injection to start stealing other people’s data. However, I do think that you should familiarize yourself with the various SQL injection techniques so that you will be better prepared to prevent them from happening in your own queries. The rest of this post will go over four common techniques used for extracting information from SQLServer, as well as simple solutions to prevent them. We’ll be looking at all of these techniques directly in SQL Server, but be aware that all of this information is potentially obtainable from an app front-end as well. Perhaps the easiest way for a hacker to retrieve additional data from an injection vulnerable query is through a UNION-based attack. A UNION-based injection attack adds a UNION or UNION ALL statement to your original stored procedure query, effectively returning any data requested by the second query. This union based attack simply concatenates the results of another query to our original row of data. Let’s say the UNION-based technique doesn’t work or we want an alternate way of determining the currently logged in account. Another option is to have the application reveal information about the database through error output. Voila! If the application doesn’t handle the error message correctly, it will conveniently show the system login as part of the error message. The first two techniques we looked at have been in-boundattacks: that is, we used the injectable query to return data to us directly. But what if there is sufficient security preventing unexpected data from being directly returned to our app? We have to get the data we want off of the server via other means. A secured server may not allow us to directly output the data we want, but that doesn’t mean we can’t infer certain information. Normally we pride ourselves in being able to write consistently fast queries. But our dedication to consistently fast executions provides hackers with ways of discerning information without any explicit data output. If our query with an expected parameter normally returns in milliseconds, forcing a 5-second delay will indirectly inform us that our guessed “sa” account name is correct. If you must use dynamic SQL, then execute your programmatically built query string with sp_executesql. This procedure will safely parameterize your inputs and prevent from injection from occurring. Finally, make sure the accounts executing your queries have as few allowed permissions as possible. This way, even if your query has an injection vulnerability, the amount of damage an attacker can do is minimal. Many of the examples above would have failed if our account simply didn’t have access to certain system tables or system procedures like xp_cmdshell. These solutions will not cover every scenario, but they will cover the majority of scenarios and improve our chances of keeping our information secure. While this type of injection flaw is easy to spot, there are other less direct ways an injection attack can occur. SQL injection attacks that delay execution until a secondary query are known as “second order”. This means a malicious user can inject a query fragment into a query (that’s not necessarily vulnerable to injection), and then have that injected SQL execute in a second query that is vulnerable to SQL injection. The above flow is how the website is supposed to function. So how does a malicious user inject SQL code into these queries if the only query they directly save input into is the UpdateSortOrder procedure? 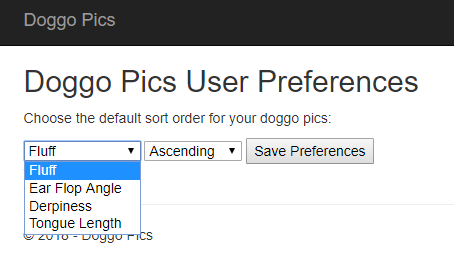 What happens next is simple: The first time our malicious user goes to view the Doggo Pics, they receive the pictures in their preferred sort order. Additionally an INSERT INTO statement executes back on the server. So even though the first query the user encounters (saving sort order preferences) is entirely SQL injection free, our second order SQL injection attack occurs when our second SQL query dynamically executes the injected code that was stored in our user preferences table in the database. How do I first and second order SQL injection attacks? I recently presented at the GroupBy conference where I showed exactly how to protect your data from these types of attacks. You can also read more about different types of SQL injection attacks and preventative solutions by reading through my blog archives.